USB Ports, USB cables, What is a usb port? USB ports are the most common port to connect devices to. I don't think any PC or laptop ships today without a usb port. It makes the connection of devices like keyboards, mice, memory sticks etc very easy to connect. I can remember, before USB, how difficult and time consuming it was to connect a device, like a disk, to my computer. First of all, you had to plan what you want to buy and where to connect it. Then you had to open the computer case and fiddle with the cables to find an open slot on the motherboard. Then you plugged the ISA card in and set the jumper to the correct setting for master or slave. If you worked with SCSI (Small Computer System Interface), it was even worse. After that was finished, you had to find a power cable that was free and plug that in. You then closed the case and switched on the PC. Then you had to tell the BIOS(Basic Input Output System) that there was a new device, and then you had to tell the operating system about the device and format it. Man, things took long in those days. Of course, things haven't changed much if you want to connect an internal disk, but to connect external devices, is so much easier today. Let's have a look at the technology. We all have to say thank you to a guy called, Ajay Bhatt. He, with the collaboration with some companies, created the USB interface. Development started in 1994 and the first standard came out in 1996. In 1998 version 1.1 of USB was widely used by vendors. 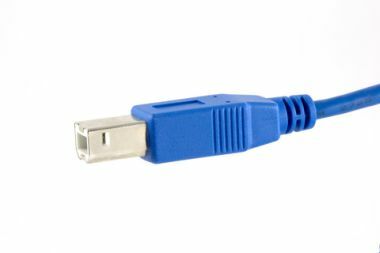 The whole idea of USB is to make it simple for us to connect external devices to our PC's and laptops. To connect a USB device is easy. You first have to find an open port on the PC or laptop. It's easy to identify. Below is a picture of a type A port. You then plug your device into the port and operating system recognizes and installs the driver. If the driver is not provided by the operating system then all you need to do is supply the driver. This usually ships with the device on a CD or DVD when you buy it. Most operating systems already has support for most external disk drives, so it should not be necessary to install the disk driver software separately. For devices like printers and scanners you would almost always install the driver yourself. This is also very simple because when you attach the device, the operating system will recognize that new hardware has been attached and will ask you to install the disk with the driver. This is where the term, "plug and play" came from. In the beginning people used to call it "plug and pray". The external device itself should already have a cable attached to it or the connector will be built into the device. If the device does not have a cable or connector then it will ship with the device. You can also buy the cables separately if needed. They are cheap and easy to find. 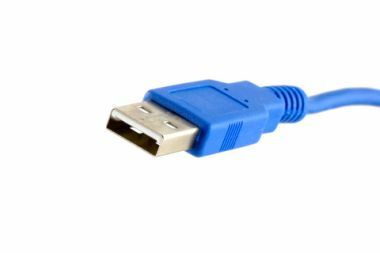 There are different types of cables that you use to connect your USB device to the port. The most common is the type A and B. Type A is very common and you probably have seen this type many times. Type B is less common and is usually found on devices like printers and scanners. The reason why they use different types is to avoid confusion when connecting devices. Type A is referred to as "upstream" that connects to your computer and type B is for "downstream" that connects to your device. Some devices already have the downstream cable built in, but with others you need to connect the cable to the device. If you look at the above picture it's impossible to connect the wrong cable in the wrong slot. You also get different type A and B connectors like mini-A, micro-A and mini-B and micro-B. Take you cell phone for instance. If you look at the USB ports, its very small and is probably a micro-B. These different cables ships with the devices and is not as easy to get as normal type-A connectors. Below is a picture of different port types. But don't fear, just look for the USB logo. If you see this logo, then you know it's a USB port. If there is no logo, then read the manual. If the device has lots of ports, then it might be advisable to read the manual. There should be pictures and explanations of the various ports on the device. This is especially true for cell or mobile phones. What can I connect to USB ports? The list goes on. But you get the idea. The reason for this is the simplicity of connecting devices. In the past thing like printers and modems were cumbersome to connect. Just think of how easy it is to connect these devices today. When USB was developed it wasn't very fast. With version 1.1 you would get about 1 Mb per second. Compared to today's standards, this is slow, but in 1998 this was not to bad for an external device. With USB ver 2.0, this went up to 30 - 40Mb/second. The standard actually allows for transfer speeds greater than this, but with all the overhead, 30 - 40Mb/second is what you will get. At the time of writing, USB 2.0 is the most widely used and just about everything is USB ver 2.0. Keep in mind that USB ver 2.0 is also backward compatible with version 1.1. This means that you can plug a USB ver 1.1 device in a version 2.0 port, it will just run at 1 Mb/second. In 2008 work started on USB 3.0. This will take the speed up to between 300Mb/second to 400Mb/second. There are also other enhancements like greater voltage supplied by the bus to your connected device. Vendors are quickly adopting this standard and are already shipping USB 3.0 devices. 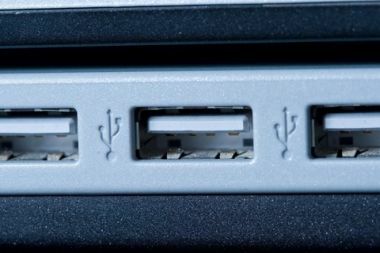 If you look at your USB ports you will probably only connect one USB device to it. The specification of USB allow you to connect up to 127 devices per USB bus or channel. So, how can you connect 127 devices to it? You use a device called an USB hub. USB hubs connect to a single port on the laptop or PC, on the hub side you can have multiple ports. See the picture below. Notice the single connection on the cable and the multiple connections on the hub. In the above picture this hub has four usb ports. I can now attach an additional 4 devices to it. This sounds great, but remember that all those devices share the 30 - 40Mb/second bandwidth. So, the more devices you connect the slower in may become. I say, may be slower, because if you only use one of those devices at a time then you won't have a problem. If you use all of those devices at the same time then each will have less than 1 Mb/second bandwidth. For example, let's say you have one USB port on you laptop. You connect a USB hub and connect 6 external disks to it. The disks are capable on handling 40Mb/second. You start to use all of the disks at the same time to save data. If you divide the bandwidth with the number of disks, then you'll get the total throughput per device. 40 Mb/second / 6 devices = 6.6 Mb/second. So, each disk will only write 6 Mb /second of data to the disk. In the example above, I used 6 disks. You will probably never connect six external disks to one USB port. But will you probably connect a printer, scanner and memory stick to you USB ports. If you use it like this, then there is absolutely not problem at all. Yep, it is. This means that some devices you connect will run of USB power and you need not connect an external power supply to the device. Be careful though, USB only supplies 500milliamps at 5 volts. For small devices like mouse and keyboards, this is enough. For bigger peripherals, like printers you would need a external power supply. Don't worry, when you buy the device it will say in the documentation whether it's USB bus powered or not. Keep this in mind when you buy devices for USB. Because of this 5 volt on the USB bus, several crazy devices have been made, like USB chargers for mobile phones, desk lights and even devices that will keep you coffee warm! Crazy. Lastly, let's look at the features of USB 2.0. Cable length can be up to 5 meters from computer to device. If you use hubs, this can be extended to 30meters. You can connect up to 127 devices. USB is bus powered. 5 Volts. USB devices are hot swappable. This means I can remove devices while the computer is powered on. USB supports power saving mode.